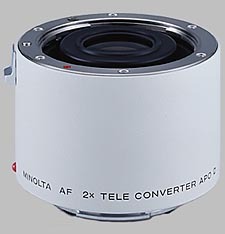 (From company literature) With the release of Konica Minolta's SSM lenses, two new teleconverters have been added to the line: AF 1.4X Tele Converter Apo (D) and AF 2X Tele Converter Apo (D). These accessories, designed for the new telephoto SSM lenses, increase the power of the lens while allowing the use of the automatic camera and lens systems. The teleconverters are compatible with the telephoto SSM lens functions as well as the functions of the D series lenses. The new SSM technology is designed to enhance the performance of Minolta SLR cameras from the Dynax 7 onwards. Other Minolta lenses are also compatible with these teleconverters. The focusing ring is easier to turn in manual focus with the use of these new teleconverters compared to the current models. The Konica Minolta 2X AF Apo (D) doesn't have any user reviews yet!